This 3-story end-unit townhouse is located just across a quiet street from the Atlantic Ocean, and is just minutes from the Village. With your own secluded beach, and being just three blocks from the famous King and Prince Resort, no one has a better location. Unlike several hotel / motel like condos that have parking garages, elevators, and long public hallways to get to your room, this unit is a true end-unit townhouse, only attached on one side. While we rent our property, it is also our home away from home. We hope you and your family will enjoy all of the features we have provided for ours. The main Master bedroom is on the second floor and has a plush king-size bed and a full private bath. The 'Guest' bedroom has two single beds and a full bath. It is also on the second floor. Upstairs we have a bedroom suite that has a queen-size bed, full bath with large tiled shower, a sitting room with cable TV, and a deck that overlooks the ocean. The deck is perfect for reading during the day, and enjoying a glass of wine under the stars at night. Downstairs, the Living room has two sofas. While the kitchen is small, the appliances are new and we have had several Thanksgiving's there. We have prepared everything from turkey dinners to steamed crabs. The kitchen table is adjacent to the living room. All have access to the TV in case the big game is on during dinner time, or the kids want to watch cartoons during breakfast. In total there are 3 TVs, each with cable and DVD players. We have also recently added WiFi broadband cable internet access for the workaholics. Please don't hesitate to call about last minute specials if your trip is within the next three weeks and you see that we are still available. 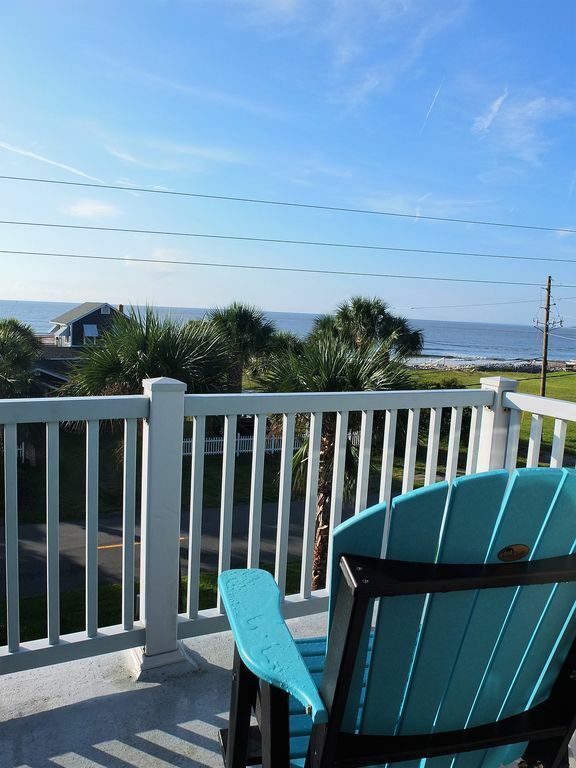 For those who have never been to St. Simons, it is the most peaceful beach destination there is. It is not commercialized, and very relaxing. Historic sites, village shopping, a lighthouse, fishing from our pier for fisherman and sight seers, and many restaurants are all within walking and/or biking distance. There are also several beautiful public and private golf courses on the island. For those who want to enjoy the ocean activities or intercoastal waterway, boating, charter fishing, and kayaking are all nearby. If we are booked on the date you are looking for, try our Island Cottage VRBO# 24065 - it's a great place as well. Even if you don't stay with us, you should come enjoy our Island as there is no other like it! 60 inch big screen TV.